ST. GEORGES, Grenada-The British Virgin Islands wrapped up the 45th Carifta Games in St. Georges, Grenada on Monday night with silver and bronze medals. 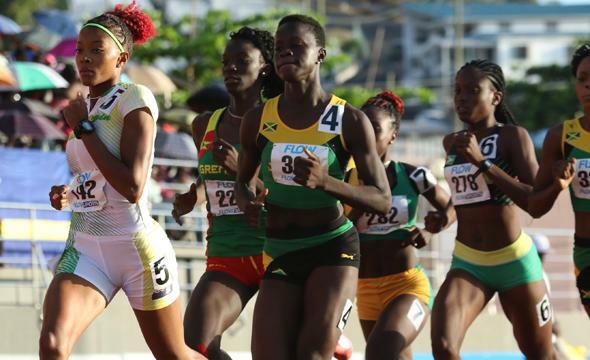 Tarika "Tinker Bell" Moses won the BVI's second silver medal in the U20 Girls 800m, to go with Lakeisha "Mimi" Warner's U20 Girls 400m Hurdles on Sunday, bringing the territory's total to three. In her first outdoor race of the season, Moses ran 2 minutes, 11.20 seconds behind Jamaica's Junelle Broomfield's 2:06.21, to end her Carifta career with a second individual silver medal along with an U17 Girls 400m silver, from 2013. "This is the most bumps and hits I ever got in an 800m race," Moses reflected after collecting her award. "But, I just listened to my coach, ran a smart race, be relaxed and I just let the Grenada girl do all the pushing, because I know I had more foot speed. So when I got by the 200m, I used my foot speed and left her and I know I had it in the bag." Reflecting on her Carifta career, Moses said in her first appearance she had a fourth place finish in the 400m. She made the 400m final in her second appearance but couldn't run because of an injury. She earned a 400m silver and the next year she couldn't run because of her hamstring. "Last year, I didn't have a good run, I was out of the game," she noted. "To get a silver in the 800m, it feels amazing to end off (my career) with this medal." The U18 Girls 4x400m Relay quartet of Judine Lacey, Zacharia Frett, Shaniyah Caul and Beyonce DeFreitas, bagged, bagged a bronze medal behind Jamaica and the Bahamas, with a time of 3:47.43. DeFreitas, 15, just missed an U18 Girls 200m bronze medal when she lowered her day old personal best from 24.14 seconds to 23.97, the No. eight performance on the BVI's All Time List. Winds robbed L'T'Sha Fahie of a personal best in the U20 race, after placing seventh in 24.38. Akeem Bradshaw was fifth in the Triple Jump with a leap of 14.86m on his second attempt, after cutting the sand at 7.13m on his opening jump, a mark that was good for fifth place in the Long Jump. Arianna Hayde and debutant Akira Phillip, finished sixth and seventh respectively in the U18 Girls Javelin Throw. Hayde had a mark of 38.60m, while Phillip recorded a personal best of 38.43m. Britney Peters, competing in the U20 Girls division, finished with a mark of 37.94 and finished sixth overall. Joshua Hill made his U18 Boys debut in the 800m with a personal best time of 2:01.72, but did not advance.